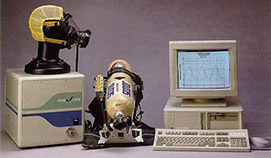 The Biosystems PosiChek3 is a computerized dynamic SCBA test bench which can test the performance of any brand of SCBA. Biosystems PosiChek3 computerized SCBA test bench has been the industry standard for thousands of fire departments, refineries, chemical plants and nuclear power stations, worldwide since it was first introduced in 1988. A number of upgrades have been incorporated to keep pace with increasingly rigorous testing criteria. Firefighters and other first responders can only work as well as the equipment they use. That’s why NFPA 1852 mandates that all compliant SCBA be tested on a calibrated breathing machine before being put into service, and at least once per year thereafter. Biosystems PosiChek3 is the only test bench that meets stringent NFPA standards. Biosystems PosiChek3 can fully evaluate the operational readiness of an SCBA in less than 2 minutes, and consumes less than 1% of its air supply. Endorsed by major cylinder manufacturers, including Luxfer and Catalina, Visual Plus 3 is the best inspection technology you can buy today − and because of its exclusive software and versatile calibration features, Visual Plus 3 will be the equipment of choice for inspecting new aluminum alloys in the future. 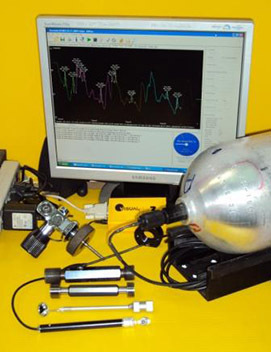 Visual Plus is a non-destructive testing (NDT) device which utilizes eddy currents to detect neck and shoulder cracks, folds or other similar imperfections in aluminum cylinders such as scuba, SCBA (all metal, hoop-wrap or full wrap), beverage, medical, industrial gas cylinders, fire extinguishers, etc. An electromagnetic wave is introduced into the metal of the vessels near the area which is desirable to inspect for imperfections (the threaded area). The wave causes currents to flow in a circular manner in the metal. They are called eddy currents because the flow is circular. An imperfection can increase the path that the currents have to flow and so make the material appear higher in resistance in that region where the imperfection is present. This generates a spike on the computer generated report which alerts the technician to a problem that requires further investigation. Hydrostatic testing alone does not reveal cracking in the neck/shoulder area of aluminum cylinders unless they are leaking. Visual Plus identifies 100% of these defective cylinders. Don't leave it to chance! Offering a wide range of Scott SCBA products and much more, Empire SCBA & Supplies delivers the absolute dependability your industry demands. Featuring advanced Scott Air-Paks, firefighter SCBA supplies and a variety of other tools, we make highest-quality solutions available to you at unbeatable prices.